ICDD databases and software products are licensed for use on a single PC. Database and software licenses grant end-users a limited, nonexclusive and nontransferable license to access the contents of the product for personal or internal business purposes; and to download such contents on the hard drive of a single computer, as needed, to facilitate data processing. It cannot be installed, accessed or displayed on more than one PC without purchasing additional licenses. It is expressly prohibited to access the database over a network, or access the database using desktop sharing or screen sharing software. License terms vary by product. Please click here for information on WebPDF-4+ licensing. It is recommended that all ICDD databases be installed and registered within the first 30 days after product purchase and receipt of product. This will insure that your database license will correspond closely with your product subscription. Please note that your product subscription is based on the month of the original invoice; not the date of the license registration key. This is the amount of time available for access to the purchased database. The license key is issued on the date of registration and will allow access to the database in accordance with the purchased product license term. The PDF-4 product line, as well as all database site and multi-year licenses are serviced by subscription. All subscriptions are based on the original invoice date. This means that PDF-4 renewals, site licenses, and multi-year licenses are due on the month of the original invoice. For example, if your original invoice was in May 2016, then your renewal will be due in May 2017. All PDF-4 products are licensed for one (1) year. ICDD offers a subscription service that provides automatic renewals for your PDF-4 products. Prior to the expiration of your license, ICDD will automatically invoice and ship your PDF-4 renewal based on your original invoice date. The license term for PDF-2 and SIeve is 5 years. The initial term of the license for PDF-2 and SIeve is five (5) years from the license registration key date. At the end of your five (5) year license term, you will have two options for your license. Option 1: Purchase a license for the current release of the PDF-2, SIeve, or PDF-4+. Option 2: Extend your original license for one additional consecutive five (5) year term, free of charge, provided that the licensed user has the same organization name and address (i.e., the registered user), and the product license has not been previously renewed or converted to a PDF-4+ product. Click here for instructions on how to extend your license. PDF-4/Axiom is licensed for use on a single PC. The term of the license shall be three (3) years from the license registration key date. It cannot be installed, accessed or displayed on more than one PC without purchasing additional seats. Two additional seats can be purchased at an additional cost. A seat is defined as single PC installation. Additional seat registrations will mirror the original registration key date. PDF-4 is licensed for use on a single PC. It cannot be installed, accessed or displayed on more than one PC without purchasing additional licenses. It is expressly prohibited to access the database over a network or access the database using desktop sharing or screen sharing software. ACCEPTANCE: PLEASE READ CAREFULLY BEFORE OPENING THIS PACKAGE. THE INDIVIDUAL OR ENTITY OPENING THIS PACKAGE (THE “LICENSEE”) AGREES TO BE BOUND BY THE TERMS OF THIS LICENSE AGREEMENT. IF THESE TERMS ARE UNACCEPTABLE, THE UNOPENED PACKAGE MAY BE RETURNED TO ICDD FOR A REFUND OF THE LICENSE FEE. 1. License. In consideration of payment of the applicable fee and compliance with the provisions of any applicable purchase order, International Centre for Diffraction Data (“Licensor”) grants Licensee a limited, non-exclusive and non-transferable license (“License”) (i) to access the contents of the enclosed disk (s) containing PDF-4 (“Licensed Product”) for personal or internal business purposes (the “Permitted Use”); and (ii) to download such contents on the hard drive of a single computer as needed to facilitate data processing for the Permitted Use. 2. Copyright. Copyright protection on the PDF-4 has been secured by ICDD under applicable laws both in the United States and in other countries that are parties to the Universal Copyright Convention or members of the Berne Union. It is understood and agreed that this Agreement does not convey any ownership interest in the PDF-4 to Licensee, all rights, title and interest therein to all copies and enhancements thereof being retained by ICDD, except as expressly provided in this Agreement. The PDF-4 shall remain proprietary to ICDD regardless of the ownership of any software with which it may be co-marketed, bundled, searched or stored. 3. Warranty Limitations. Licensee’s sole remedy for any defective Licensed Product shall be replacement of the Licensed Product, which right must be exercised by written notice given within 30 days of purchase. Licensor shall not be liable for any damages whatsoever (including without limitations consequential or punitive damages). Licensor makes no express or implied warranty (including without limitation any warranty of merchantability or fitness for a particular purpose or its compatibility of the PDF with any software) with respect to the Licensed Product. 4. Fees. The schedule of fees for the license granted hereby is separately published by ICDD (Catalog, ICDD Website), and such schedule, as amended by ICDD from time to time, is hereby incorporated into this Agreement and made a part hereof. All rights of Licensee under this Agreement are subject to full and prompt payment of the applicable fee(s). 6. Copies. Licensee may make one (1) back-up copy of the Licensed Product for security purposes only, provided, however, that (i) such copy shall be considered, subject to the License, the property of ICDD; (ii) Licensee shall be entitled to retain only one (1) such copy at any given time; (iii) ICDD’s copyright notice shall be affixed to any such copy; and (iv) such copy shall be RETURNED TO ICDD OR DESTROYED with the original Licensed Product upon expiration or termination of this Agreement. The original and back-up copy may be used only in connection with a single computer. Simultaneous use of the Licensed Product and any back-up is strictly prohibited. Except as expressly provided herein, Licensee may not: (i) modify or create any derivative works of the Licensed Product or documentation, including translation or localization; (ii) decompile, disassemble, reverse engineer, or otherwise attempt to derive the source code for the Licensed Product (except to the extent applicable laws specifically prohibit such restriction); (iii) redistribute, encumber, sell, rent, lease, sublicense, or otherwise transfer rights to the Licensed Product; (iv) remove or alter any trademark, logo, copyright or other proprietary notices, legends, symbols or labels in the Licensed Product; or (v) publish any results of benchmark tests run on the Licensed Product to a third party. 7. Terms of the Agreement. ICDD is incorporated as a non-profit organization in the State of Pennsylvania, USA; therefore the terms of this agreement are governed by applicable laws of the Commonwealth of Pennsylvania and the United States of America. Neither the Licensed Product nor the underlying information or technology may be downloaded or otherwise exported or re-exported into any country subject to U.S. trade sanctions or the U.S. Commerce Departments Table of Denial Orders. If you transfer possession of any copy, modification, or merged portion of the Licensed Product to another party, your license is automatically terminated. This Agreement will be considered terminated (a) upon 60 days written notice by either party or (b) upon breach of the terms and conditions hereof by either party immediately upon written notice thereof. In the event of termination, the License shall automatically expire and the Licensed Product, together with any copy thereof, shall be RETURNED TO ICDD OR DESTROYED within (3) business days; and Licensee shall cease all use of and access to the Licensed Product and the right of ICDD to pursue any of its rights under this Agreement or under applicable law shall not be extinguished. PDF-2 is licensed for use on a single PC. It cannot be installed, accessed or displayed on more than one PC without purchasing additional licenses. It is expressly prohibited to access the database over a network or access the database using desktop sharing or screen sharing software. ACCEPTANCE: LEASE EAD AREFULLY BEFORE PENING HIS ACKAGE. HE INDIVIDUAL OR ENTITY OPENING THIS PACKAGE (THE “LICENSEE”) AGREES TO BE BOUND BY THE TERMS OF THIS LICENSE AGREEMENT. IF THESE TERMS ARE UNACCEPTABLE, THE UNOPENED PACKAGE MAY BE RETURNED TO ICDD FOR A REFUND OF THE LICENSE FEE. 1. License. In consideration of payment of the applicable fee and compliance with the provisions of any applicable purchase order, International Centre for Diffraction Data (“Licensor”) rants icensee imited, on-exclusive and on-transferable icense “License”) i) o ccess the contents of the enclosed disk (s) containing PDF-2 (“Licensed Product”) for personal or internal business purposes (the “Permitted Use”); and (ii) to download such contents on the hard drive of a single computer as needed to facilitate data processing for the Permitted Use. 2. Copyright. Copyright protection on the PDF-2 has been secured by ICDD under applicable laws both in the United States and in other countries that are parties to the Universal Copyright Convention or members of the Berne Union. It is understood and agreed that this Agreement does not convey any ownership interest in the PDF-2 to Licensee, all rights, title and interest therein to all copies and enhancements thereof being retained by ICDD, except as expressly provided in this Agreement. The PDF-2 shall remain proprietary to ICDD regardless of the ownership of any software with which it may be co-marketed, bundled, searched or stored. 5. License Term. The term of the License shall be five (5) years from the license registration key date, as provided in the initial paragraph of this Agreement (“Acceptance”). 6. Copies. Licensee may make one (1) back-up copy of the Licensed Product for security purposes only, provided, however, that (i) such copy shall be considered, subject to the License, the property of ICDD; (ii) Licensee shall be entitled to retain only one (1) such copy at any given time; (iii) ICDD’s copyright notice shall be affixed to any such copy; and (iv) such copy shall be RETURNED TO ICDD OR DESTROYED with the original PDF-2 upon expiration or termination of this Agreement. The original and back-up copy may be used only in connection with a single computer. Simultaneous use of the Licensed Product and any back-up is strictly prohibited. any trademark, logo, copyright or other proprietary notices, legends, symbols or labels in the Licensed Product or (v) publish any results of benchmark tests run on the Licensed Product to a third party. WebPDF-4+ is licensed specifically to the user (company or individual) whose name and details of the principal site are registered with ICDD. The software may be installed on any number of computers; however, the licensed software can only be operated on the computer that carries the hardware DONGLE. It is expressly prohibited to connect via a network, desktop sharing, or screen sharing software to the computer carrying the dongle for the purpose of accessing the WebPDF-4+ database. 1. License. In consideration of payment of the applicable fee and compliance with the provisions of any applicable purchase order, International Centre for Diffraction Data (“Licensor”) grants Licensee a limited, non-exclusive and non-transferable license (“License”) (i) to access the contents of the enclosed Dongle containing WebPDF-4+ (“Licensed Product”) for personal or internal business purposes (the “Permitted Use”); and (ii) to download such contents on the hard drive as needed to facilitate data processing for the Permitted Use. 2. Copyright. Copyright protection on the WebPDF-4+ has been secured by ICDD under applicable laws both in the United States and in other countries that are parties to the Universal Copyright Convention or members of the Berne Union. It is understood and agreed that this Agreement does not convey any ownership interest in the WebPDF-4+ to Licensee, all rights, title and interest therein to all copies and enhancements thereof being retained by ICDD, except as expressly provided in this Agreement. The WebPDF-4+ shall remain proprietary to ICDD regardless of the ownership of any software with which it may be co-marketed, bundled, searched or stored. 3. Warranty Limitations. Licensee’s sole remedy for any defective Licensed Product shall be replacement of the Licensed Product, which right must be exercised by written notice given within 30 days of purchase. Licensor shall not be liable for any damages whatsoever (including without limitations consequential or punitive damages). Licensor makes no express or implied warranty (including without limitation any warranty of merchantability or fitness for a particular purpose or its compatibility of the WebPDF-4+ with any software) with respect to the Licensed Product. 6. Except as expressly provided herein, Licensee may not: (i) modify or create any derivative works of the Licensed Product or documentation, including translation or localization; (ii) decompile, disassemble, reverse engineer, or otherwise attempt to derive the source code for the Licensed Product (except to the extent applicable laws specifically prohibit such restriction); (iii) redistribute, encumber, sell, rent, lease, sublicense, or otherwise transfer rights to the Licensed Product; (iv) remove or alter any trademark, logo, copyright or other proprietary notices, legends, symbols or labels in the Licensed Product; or (v) publish any results of benchmark tests run on the Licensed Product to a third party. PDF-4/Axiom is licensed for use on a single PC. It cannot be installed, accessed or displayed on more than one PC without purchasing additional licenses. It is expressly prohibited to access the database over a network or access the database using desktop sharing or screen sharing software. ACCEPTANCE: LEASE READ CAREFULLY BEFORE OPENING THIS PACKAGE. THE INDIVIDUAL OR ENTITY OPENING THIS PACKAGE (THE “LICENSEE”) AGREES TO BE BOUND BY THE TERMS OF THIS LICENSE AGREEMENT. IF THESE TERMS ARE UNACCEPTABLE, THE UNOPENED PACKAGE MAY BE RETURNED TO ICDD FOR A REFUND OF THE LICENSE FEE. 1. License. 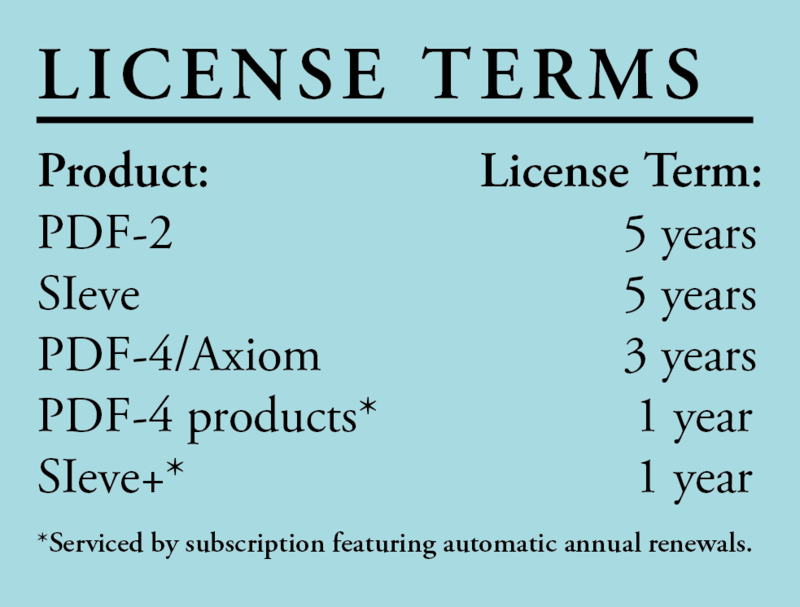 In consideration of payment of the applicable fee and compliance with the provisions of any applicable purchase order, International Centre for Diffraction Data (“Licensor”) grants Licensee a limited, non-exclusive and non-transferable license “License”) i) to access the contents of the enclosed disk (s) containing PDF-4/Axiom (“Licensed Product”) for personal or internal business purposes (the “Permitted Use”); and (ii) to download such contents on the hard drive of a single computer as needed to facilitate data processing for the Permitted Use. For further information visit www.icdd.com/licenses. 2. Copyright. Copyright protection on the PDF-4/Axiom has been secured by ICDD under applicable laws both in the United States and in other countries that are parties to the Universal Copyright Convention or members of the Berne Union. It is understood and agreed that this Agreement does not convey any ownership interest in the PDF-4/Axiom to Licensee, all rights, title and interest therein to all copies and enhancements thereof being retained by ICDD, except as expressly provided in this Agreement. The PDF-4/Axiom shall remain proprietary to ICDD regardless of the ownership of any software with which it may be co-marketed, bundled, searched or stored. 5. License Term. The term of the License shall be three (3) years from the license registration key date, as provided in the initial paragraph of this Agreement (“Acceptance”). 6. Copies. Licensee may make one (1) back-up copy of the Licensed Product for security purposes only, provided, however, that (i) such copy shall be considered, subject to the License, the property of ICDD; (ii) Licensee shall be entitled to retain only one (1) such copy at any given time; (iii) ICDD’s copyright notice shall be affixed to any such copy; and (iv) such copy shall be RETURNED TO ICDD OR DESTROYED with the original PDF-4/Axiom upon expiration or termination of this Agreement. The original and back-up copy may be used only in connection with a single computer. Simultaneous use of the Licensed Product and any back-up is strictly prohibited. Except as expressly provided herein, Licensee may not: (i) modify or create any derivative works of the Licensed Product or documentation, including translation or localization; (ii) decompile, disassemble, reverse engineer, or otherwise attempt to derive the source code for the Licensed Product (except to the extent applicable laws specifically prohibit such restriction); (iii) redistribute, encumber, sell, rent, lease, sublicense, or otherwise transfer rights to the Licensed Product; (iv) remove or alter any trademark, logo, copyright or other proprietary notices, legends, symbols or labels in the Licensed Product or (v) publish any results of benchmark tests run on the Licensed Product to a third party. 5. License Term. The term of the License shall be five (5) years from the license registration key date, as provided in the initial paragraph of this Agreement (“Acceptance”). At the end of the licensing period, the product license can be extended for one additional five (5) year license term, free of charge, provided that the licensed user has the same organization name and address (i.e., the registered user) and the product license has not been previously renewed or converted. License extensions will be processed using ICDD’s license extension procedure (www.icdd.com/licenses). ICDD’s pricing and licensing policies are integrated to provide value to our customers in the form of user options for price and performance. PDF-4 products contain more data from contracted global sources and annually upgraded software features. These performance products are sold with annual renewable licenses and are serviced by subscription. The PDF-2 database provides basic functionality and data and is licensed for 60 months. These value options are designed to provide users with optimized service selections for leading materials research laboratories, teaching facilities, and quality control operations. ICDD offers annual renewals for our database products. Annual renewals contain new data and new database capabilities. Pricing policies for all products are designed to reward frequent update customers, site laboratories, and degree granting academic institutions, through price discounts. Since license terms and pricing are combined and customized to service different segments of the scientific community, licenses are not transferable (for exceptions see ICDD License Transfer Policy). The majority of PDF databases are sold through ICDD’s global distribution network. Our network includes equipment manufacturers, regional distributors, and licensed software developers who program commercial data analysis programs that work seamlessly with our databases. In order to validly transfer or assign an existing ICDD software or database license, choose the appropriate procedure below: Host Transfer, License Transfer, or Affiliate Transfer. If you transfer the license for a product suite or site license, the license applies to the entire suite of products. Individual products within a product suite are not eligible for a transfer of license. The transfer of a license includes all previous versions of that product. If you transfer your registered copy, then you transfer your rights to all previous versions of that license as well. PC failures or operating system reconfigurations may require the user to transfer the license from the registered host PC to another PC. As long as the licensed entity or product type has not changed from the original registration, a re-registration to a new PC environment can be done. Click here for instructions on how to re-register or contact registration at ICDD. Host transfers are limited to once a year and are subject to approval by the ICDD. Licenses are not transferable, with the exceptions of transfers due to acquisition, merger, consolidation, or transfer to an affiliate. A licensed customer does not need ICDD’s consent to transfer licenses in the event of an organization acquisition, merger or consolidation. The ICDD needs to be notified of a change in organization name, contact name, or address if the user wants to remain eligible for future license renewal discounts. Notification can be made using ICDD’s online license transfer form or by directly contacting ICDD customer service (sales@icdd.com). Click here to download the Transfer of License form. An entity may transfer its right to use the Powder Diffraction File and associated software to its Affiliate. An Affiliate is another entity where at least 50.1% of its voting power is owned or controlled by the transferring entity or where as least 50.1% of the transferring entity’s voting power is owned or controlled by the transferee. In the specific case of academic institutions, an affiliate may also be a staff/faculty member of the registered entity. In the case of a transfer to an affiliate, the transferring entity must apply to ICDD for approval of the re-license using the transfer of license application. The original licensee must approve the transfer in writing and, upon signature of the application, the original licensee’s licenses are terminated. Click here to download the Affiliate Transfer of License Application.